I’ve known people who came close to a complete Time Lordish, immediate regeneration, and done it successfully. Tossing away an old consumer-driven, high-spending life for one of home-spun simplicity. Deciding on a complete change of career and two years later, there they are. But, unlike the Doctor*, I’m not someone who can pull off an entire life and body makeover in one go and have it stick. I need to take my changes at a slower pace in order for them to have any staying power. I suspect I’m not alone. Like many others, I’m making an effort at healthier, more sustainable living, but I’m pacing myself. I’ve seen enough folks go for total immersion and burn out quickly. Because it seems overwhelming, impossible even, if you have to change everything at once. So I take the “Bird by Bird” approach. For the past several years, I’ve been trying to change one thing at a time until it becomes habit. Then I move on to the next change. Some steps are big, some are tiny. But they’re taking me in the direction I want to go. I started by being more mindful of recycling. Since we have curbside recycling where I live, this wasn’t so difficult. It was more a matter of remembering than anything. Don’t forget to flatten the cereal box and put it in the cardboard, rather than the trash. Once the neural pathways for proper sorting were established in my brain, it was on to saving bread bags for re-use. Eight years ago, my husband and I bought a house with a large yard. For the first time in my life, I became interested in gardening and landscaping. We started growing a little of our own food. By “we”, I mean my husband does the lion’s share of tilling and planting, while I harvest and do the occasional weeding. Then I started researching native plants for other areas of the yard. I’ve put in low-maintenance, not-so-much-water-needing stuff in a couple of areas now. I have coneflowers on one hillside and some weigela in another spot. I plan to keep adding with one plant or one small area each year. If I thought I had to do the whole yard at once, I’d never get started. After this, we started composting. Last year, I finally put an insulated jacket on our water heater. One more step. We aren’t in the financial bracket to be able to replace all appliances at once, but when necessity dictates it – something breaks down beyond repair – we’ve committed to buying the most energy-efficient we can. One more step. A couple of years ago, my husband put up clotheslines in the back yard, at my request, and it didn’t take me too long to get in the habit of using them. I drink gallons of iced tea every summer. Every year, I think I should get a buy a jar to use for sun brewing. This year, I decided to make sun tea my next good habit. 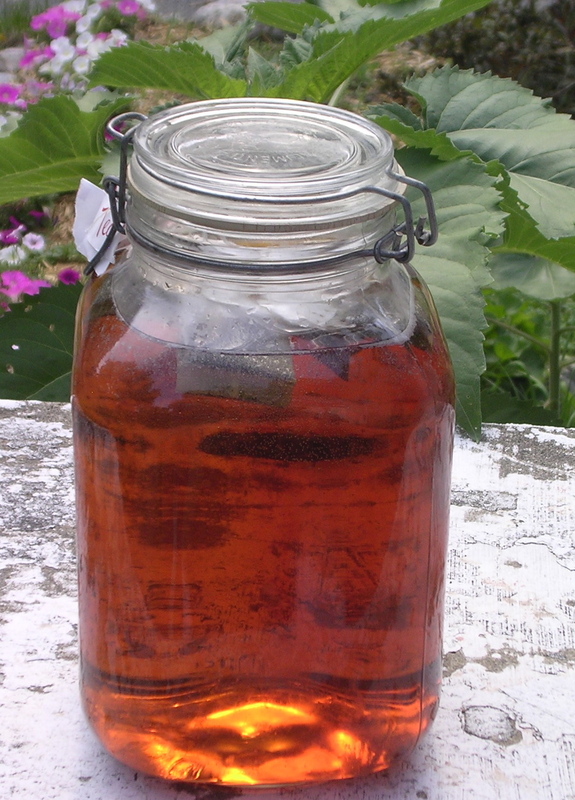 I realized I already had an old glass canister with the rotten seal would be perfect for sun tea, as it was no longer good for storing sugar. The price can’t be beat. I buy tea bags by the 100. One big pitcher of tea, made with free solar power, costs in the neighborhood of 15 cents. Not sure what my next ecothriftyhealthy self-improvement step will be. I’ll decide that once I realize sun tea is a habit and no longer a novelty.